Flim Flammer: Quick... Hide your SPOONS! Reality television (which is, without a doubt, one of the most oxymoronish phrases in history) has finally hit rock bottom. Long-time fraud and huckster Uri Geller is hosting an American Idol-style show to find an heir to his psychic throne. 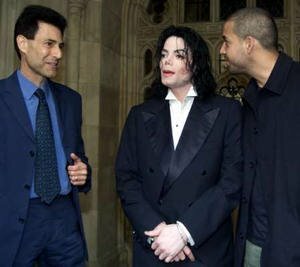 Geller, pictured at left with Michael Jackson and David Blaine, might rightfully be called the king of the spoon benders, but that hardly necessitates a televised search for an heir. James Randi must be incredibly amused.